Keen to catch up with the military technology of the Western powers at the turn of the 1930s, the Soviet Union seized the opportunity of purchasing the chassis of a groundbreaking new tank from U.S. engineer John Walter Christie. Although the vehicle required further adaptation for the battlefield, by World War II it had become one of the most common tanks in the Red Army. American engineer John Walter Christie had his share of flunked designs while creating a fundamentally new and effective tank for the U.S. military in the 1920s. First his vehicle was too cramped for the crew and shook too much when in motion. Then the U.S. Marine Corps rejected his amphibious variant. Christie’s passion, however, was for designing speedy light-weight tanks that could launch lightning strikes at the enemy and then drive a deep wedge through the breach. The same tactic was favoured by the Soviet military command, and so the two sides were destined to pool their resources ahead of the Second World War. Christie’s ultimate goal was to build a machine that only had caterpillars, instead of interchangeable track and wheel systems. This concept also appealed to the Soviet military theorists of the time, while the strong cavalry component and traditions of the Red Army created a useful synergy with the U.S. design approach. Moscow’s army was commanded mainly by former cavalry officers who were strong advocates of rapid frontal breakthroughs and deep penetration into enemy territory. In 1929, a Soviet delegation met Christie while touring European and American armaments plants in search of new armored vehicle projects. While he was still using a dual wheel and caterpillar system, the American had come up with a unique solution in perfecting his chassis design by using large springs as shock absorbers. However, extra space was needed to house them, which ran counter to the small, fast tank design he preferred. Christie showed his innovative skills through his construction of a lever system that turned the damping effect of the springs from the vertical to a horizontal position, allowing the springs to be large-sized in a smaller chassis. The innovation caught the attention of the Soviet delegation, which decided to act quickly since the challenge was fast growing from rivals in tank design. Poland in particular was now emerging as a potential enemy on the future battlefield. The Soviets decided not to buy the whole tank itself but just the chassis, which was the most attractive feature of Christie’s model. Another big incentive to work with him was his agreement to transfer to the Soviets all of the design’s technical documentation and to personally participate in setting up production of tanks in the USSR. He also allowed the Soviet engineers access to other useful products, notably the Liberty engines used in the Christie tank which were later made by Soviet factories under a different name. The Soviets paid $60,000 for two sample tanks, a huge sum at the time, plus a further $4,000 for spare parts. But the $100,000 bulk of the costs went on the acquisition of technical rights and patents. A main obstacle to the deal was the absence of diplomatic relations between the Soviet Union and the United States in 1930, which meant transactions had to be formally carried out by the Amtorg company, established by the Soviet government for the procurement of technology abroad. Christie and the head of the Soviet delegation, Innokenty Khalepsky, also concluded a verbal “gentlemen's agreement” to help smooth the way forward. By the end of 1930, the two samples without turrets were shipped to the Soviet Union, where engineers in Moscow studied them down to the minutest detail. The Soviet engineers had by now accrued valuable experience working with foreign armored vehicles. Overall, Christie’s tank chassis made a favorable impression on them in the workshop, but the acid test would be the endurance trials. Over 10 days the turret-less U.S. tank covered a distance of 150 km (93 miles). Without tracks and running on wheels on the highway it clocked up an unprecedented speed of 70 km/h (43 mph). In wheeled mode it still overcame trenches and rows of barbed wire. But flaws in the model also became evident: The tank’s suspension was not sufficiently stable and was prone to breaking. The driver's seat was cramped and the steering system hard to use, exhausting the driver after five hours of running time. The engine also overheated and control deteriorated when traveling at maximum speed. In short, there was still plenty of work to do but the vehicle’s potential was significant, as the test commission noted in its conclusions: "The Christie tank in the form in which it was presented at the trials is a highly interesting machine with universal movement, [but] requires extensive development as a fighting machine and the introduction of a number of design improvements and changes." The prototype was adopted for production with a new classification as the BT bystrokhodny tank, or high-speed tank. Meanwhile, it was decided to shut down production of the T-18. The manufacturing order for the Christie-based tanks went to the Kharkov factory, one of the largest in the country, which specialized in building tracked vehicles. 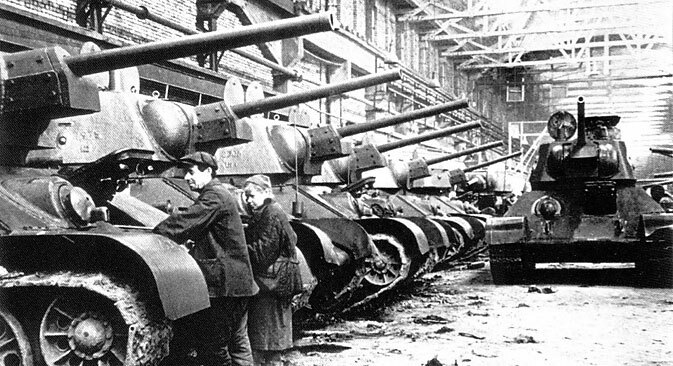 A year later, the production of the BT was launched, and by the outbreak of World War II the tank was one of the most widespread in the Red Army. However, the most historic development based on Christie’s design would be the T-34, the tank that changed the tide of the war for the Soviet Union.